Think you can’t afford a cleaning service? Think again. In the busy world we live in, time is money, quite literally. Time spent cleaning is money wasted. If you desire a clean home, but lack the time to clean it as thoroughly as you would like, a maid service in Greensboro, NC, can actually save you money. Let’s count the ways. Get More Paying Work Done. Whether you work from home or at an office, on a salary or hourly pay rate, you are certain to get more work done for your employer when you aren’t burdened with housework. If you own a business or work for yourself, this is especially true. Spend less time cleaning, make the most of your time, and earn more money. Spend Less on Cleaning Supplies. When you hire a house cleaning service, they bring their own supplies. Cleaning supplies, especially earth-friendly ones, can be expensive. Over time, buying cleaning supplies can really add up and be a drain on your paycheck. Since that expense is already built into your house cleaner’s fee, you can save money at the store. Write it Off on Your Taxes. Do you work from home or run a business out of your home? Do you own any residential rental properties? If so, you can write off house cleaning expenses when you file your taxes, and that includes the fee you pay to your maid service in Greensboro, NC. You can save a lot of money and hassle by having a rental property thoroughly cleaned by a professional house cleaning service in between tenants, and that expense is a write off opportunity. Less Stress = Better Health = Lower Medical Bills. Eliminate one major source of stress in your life by letting someone else handle your housecleaning. Household duties are a large percentage of the daily tasks that are part of our everyday lives. When you let go of this responsibility, it can be a huge weight off of your shoulders. Studies have proven the negative effects of stress on our health. By reducing stress you improve your health, which in turn can lower your medical expenses. It is also safer for senior citizens or anyone who struggles with the physical demands of housekeeping. The biggest, and perhaps best, benefit of hiring a housecleaning service is the extra time you will have to spend with those you love. There are some things you just can’t put a price on. Let a trusted maid service in Greensboro, NC, handle the housework while you enjoy life with your family and friends. 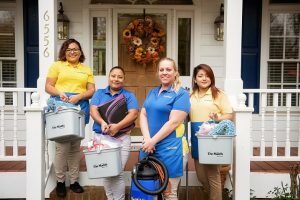 The Maids have been helping families keep their homes clean in Greensboro and the rest of the Triad for the last decade. Their 22-Step Healthy Touch Deep Cleaning System gets homes spotless as well as germ and allergen free. Call today for a free estimate: (336) 292-7805.
https://www.themaidstriad.com/wp-content/uploads/2016/08/logo.png 0 0 The Maids https://www.themaidstriad.com/wp-content/uploads/2016/08/logo.png The Maids2017-07-18 17:26:522017-12-20 18:56:19Did You Know Hiring a Cleaning Company Can Save You Money? Homeowners need to be more wary of the cleaning methods they use to keep their houses tidy. Detergents, disinfectants, and other similar substances with high toxicity can cause medical complications to families, particularly vulnerable children. The article posits that even pets are susceptible to high doses of cleaning agents, and they too are at risk. For safe and healthy house cleaning in Greensboro, NC, residents should hire a cleaning service that uses environmental methods such as The Maids of the Triad. Although cleaning agents made from artificial ingredients are very effective in destroying bacteria and germs, they are not the only things homeowners can use to tidy up their residence. Cleaning solutions made from all-natural ingredients do exist, and they are relatively harmless to use. To fully maximize these eco-friendly materials, homeowners should hire professional cleaners in Greensboro, NC who know how to best use such green products. It is important for families to first ask cleaning service companies if they use green products before hiring them as a precaution.